How often does my electrical installation need to be checked? Accordion ContentTypically, every five years, though in some circumstances it may be different. For example, a new installation may not need testing for ten years as it would be considered still to be in a fair condition for continual use after such a relatively short life time. However, it is recommended that the installation is inspected and tested at any change of ownership/occupancy. As a landlord do I need an electrical certificate by law? The Landlord and tenants Act 1985 say that all properties must be safe for use. Without having an electrical condition report (ECR) carried out, it can not be determined that the installation is safe for continual use. It is an urban myth that if the fuses do not blow the wiring is okay. There are many factors why an electrical circuit will break down and become unsafe. The fuses or circuit breakers should break on overload or short circuit, but that is usually when the fire has melted the cable, or an electric shock has taken place. Do I need to have a fire alarm fitted? It is always a good idea to have an early warning system, in the event of a fire. Domestically, items are often charged overnight as well as other electrical items permanently connected, such as fridges and freezers. Commercially, Customers and staff members need to evacuate a building quickly and safely before any fire takes hold. However, this should all be subject to a fire risk assessment, which is mandatory in all commercial and industrial properties. All metal parts of an installation or an appliance must be earthed. This is so that if a fault occurs, the earthing conductor will minimise the risk of electric shock, should anyone be touching those metallic parts. This is done by safely allowing the fault current to flow to earth and disconnect the protective device, thus removing the danger. 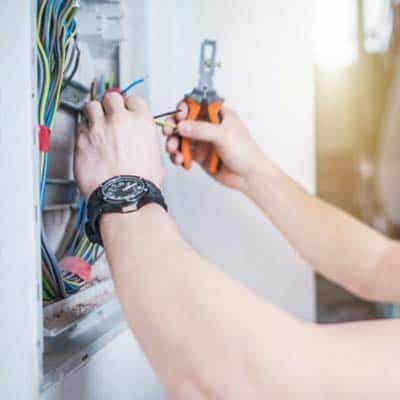 Bonding is connecting metallic parts, which could be used by any fault current flowing to earth, such as metallic water, or gas pipes entering the property, back to the incoming earth terminal. This reduces the touch voltage, should anyone be touching a fault on a metallic enclosure and a water pipe for example. Supplementary earth bonding is linking all exposed metal work together, within a special location, such as a bathroom. Is there a cost for obtaining a quote? Will the work I have done be guaranteed? For your complete peace of mind, all the work we do is guaranteed. Will you take away any associated rubbish on completion of the work? We pride ourselves on working in a clean, tidy and respectful manner, and ensure that we remove all associated rubbish before we leave your property.